In the six decades before the Civil War, approximately one million enslaved people were forced to leave behind their homes and families and were sent to labor in the sugar cane and cotton fields of the Deep South. They traveled by steamboats and sailing ships, wagons and railcars but most came on foot. When they arrived in New Orleans, the traders would advertise the sales of enslaved men and women in the local newspapers. 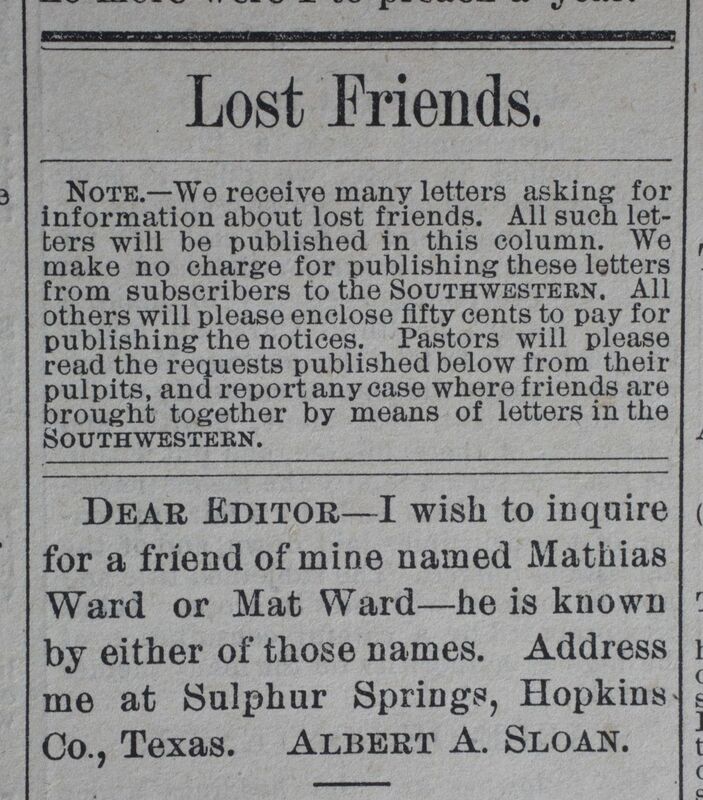 The newspapers were also regularly used to post rewards for the return of runaway slaves. The exhibit presented many of these advertisements in a booklet which was a very thorough compilation of images and text of the exhibit. The booklet is not currently available as a PDF but I have made a request with the Historic New Orleans Collection that the guide be published online. I performed a few searches for surnames of my client, Gesenia Sloan Pena to see if any of her family names were listed. I only found two matches for the surname "Sloan." 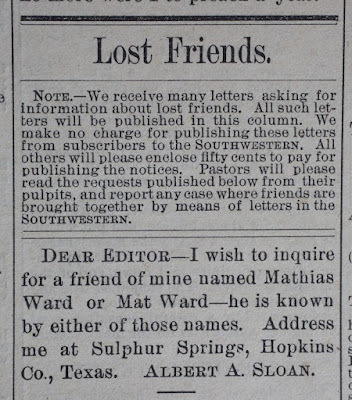 Published in the Southwestern Christian Advocate on March 11, 1880. 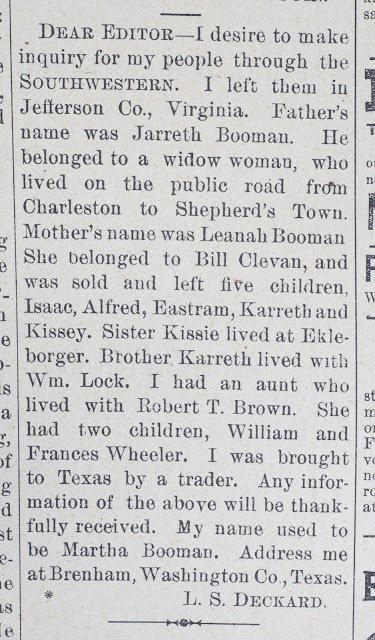 Published in the Southwestern Christian Advocate on May 13, 1880. After reviewing the description again, it became clear that the online database only includes one year of the advertisements that were published for over forty years by the Southwestern Christian Advocate newspaper. It is also clear that the contents of these ads are a treasure trove for African American family history researchers. The first ad directs pastors to read the requests from their pulpits and to report any cases of reunions which were facilitated by means of the letters published in the Southwestern. I would certainly like to read one of those reports. The Lost Friends database can be searched by first name, last name or full name or they can be searched by state, county or city. The advertisements also can be browsed. Perusal of these advertisements tell many stories of lost family and friends. The names of slave owners are listed along with names of parents, spouses, children and other family members. 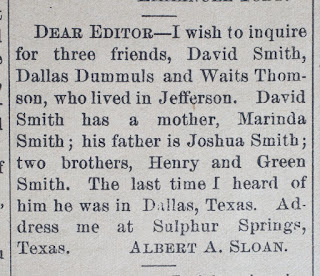 Published in the Southwestern Christian Advocate on November 13, 1879. 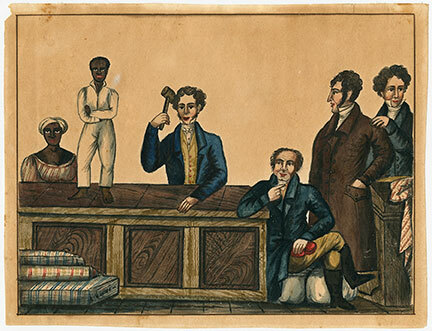 This next article shows how names that were used during slavery often changed after emancipation. The Rev. B.M. Taylor used the surname of his slave owner, Louis Taylor. 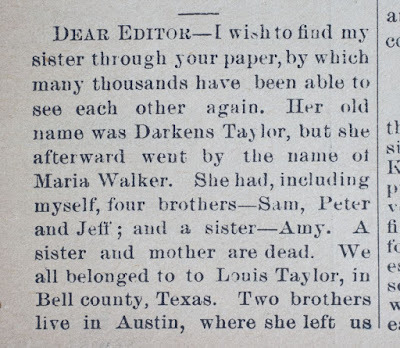 Presumably his brothers, Sam, Peter and Jeff and sister Amy also went by Taylor. 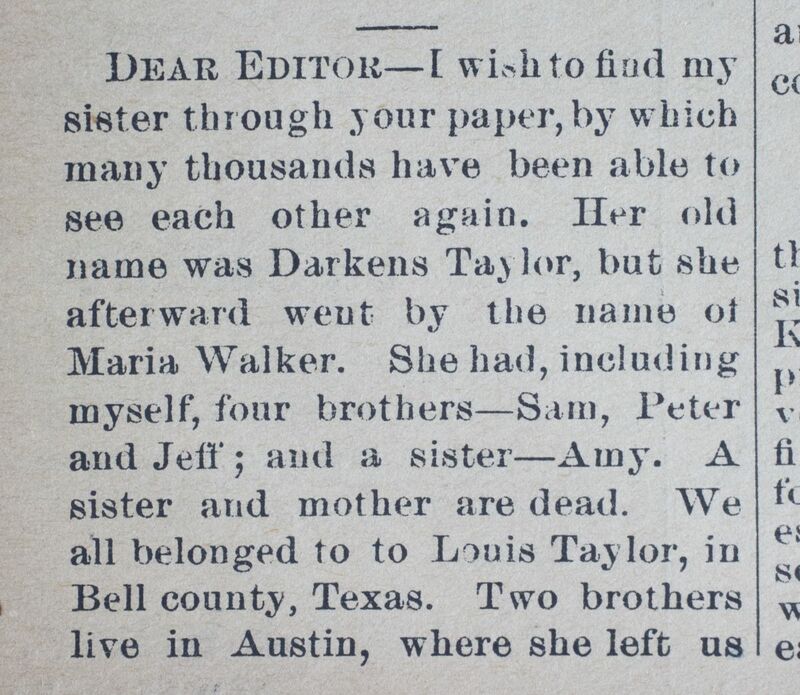 However, their lost sister, Darkens Taylor changed her name to Maria Walker. 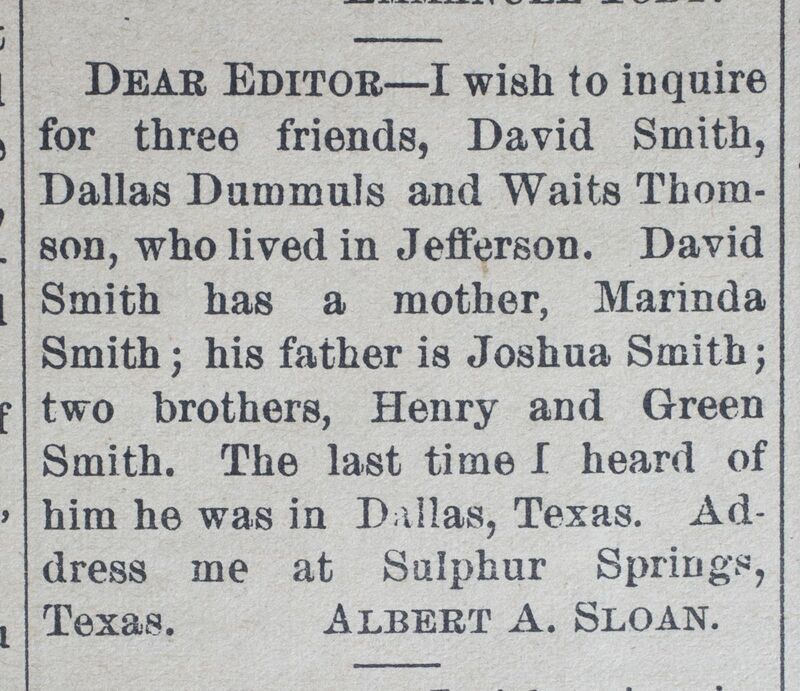 Published in the Southwestern Christian Advocate on March 25, 1880. Nick, I didn't know this even existed. 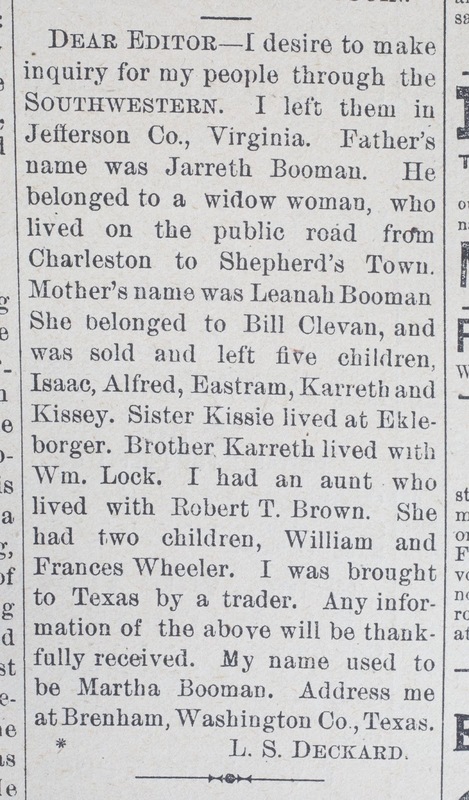 What a wonderful service the paper did in attempts to reunite those affected by slavery. I love that they said submissions would run for free for their subscribers or a small fee for non-subscribers. I too would love to see letters of reunions. Thank you for sharing this information.